Trump is unencumbered by any knowledge of the Palestinians, their history, their politics, or their legitimate struggle for statehood. Sachs Ron/CNP/ABACA ABACA/PA Images. All rights reserved.At the press conference after his meeting with Israel’s prime minister on 15 February, president Trump displayed ignorance and irresponsibility in roughly equal portions. In a single sentence, he blithely broke away from two decades of US commitment to a two-state solution to the Israeli-Palestinian conflict. Trump’s narrow focus on Israel sets him apart from postwar American presidents. Their stand on the Arab-Israeli conflict divides American presidents into two broad schools of thought: the even-handed and the “Israel first”. Jimmy Carter is the best example of the former, whereas George W Bush is the leading example of the second and much larger group. Trump does not fall neatly into either category because he is utterly one-sided in his identification with Israel. He is unencumbered by any knowledge of the Palestinians, their history, their politics, or their legitimate struggle for statehood. Ever since the Oslo Accord was concluded by the PLO and Israel in 1993, the creation of an independent Palestinian state alongside Israel has been the cornerstone of American diplomacy under both Democratic and Republican administrations. While this was the policy at the declaratory level, America failed to exert effective pressure on Israel to implement it. Indeed, the very existence of the so-called “peace process” provided Israel with a convenient cover for promoting the Zionist settler-colonial project. Trump did not rule out a two-state solution, but he implied that his administration has no preference regarding the shape of the final peace agreement. Standing alongside Mr Netanyahu, the neophyte president said: “I’m looking at two-state and one-state and I like the one that both parties like. I’m very happy with the one that both parties like”. Referring to the Israeli prime minister by his nickname, but no Palestinian leader by any name, he added: “I can live with either one. I thought for a while it looked like the two-state, looked like it may be the easier of the two, but honestly if Bibi and the Palestinians, if Israel and the Palestinians are happy, I’m happy with the one they like the best”. This vague and incoherent kind of talk on a crucially important issue is typical of the Trump White House. Under his mercurial management, the White House team is chaotic and dysfunctional. There is no decision-making structure, no rules, and no coordination in the formulation of foreign policy. Nor is it clear who the key players are in each particular area of policy. Within Trump’s inner circle there are advisers with wildly divergent views. Some of them are stone-cold racists and white supremacists. Hence the strange statement issued by the president on International Holocaust Remembrance Day, which made no mention of either Jews or antisemitism. On the other hand, two of Trump’s closest advisers on Israel-Palestine are not just Orthodox Jews but ardent Zionists. One is his son-in-law, Jared Kushner, a real estate investor with zero diplomatic experience whose family foundation financially supports the illegal settlements on the West Bank and the Israeli military. Trump appointed the 36-year-old Kushner as senior White House adviser and put him in charge of brokering a peace deal between Israel and the Palestinians. The other influential adviser is David Friedman, Trump’s real estate and bankruptcy lawyer for the last 15 years, who was picked to be America’s ambassador to Israel. Friedman is a controversial figure even among American Jews on account of his fervent pro-settlement views and firm opposition to a Palestinian state. Friedman does not consider the settlements as an impediment to peace and he does not think that annexing parts of the West Bank would compromise Israel’s Jewish or democratic character. He is the chairman of the American Friends of Beit El, one of the more hard-line ideological settlements on the West Bank. Friedman raises around $2 million of tax-free donations a year for the Beit El. One Donald J Trump contributed $10,000 to this charity. Friedman is also a strong supporter of moving the American embassy from Tel Aviv to Jerusalem, one of Trump’s campaign promises. This move would ring the death knell of the two-state solution. It would mean American recognition of Israeli sovereignty over the whole of Jerusalem, including the Muslim holy places in the Old City. An editorial in the Israeli newspaper Ha’aretz, titled “David Friedman Is Unfit to Serve as U.S. Envoy to Israel,” described him as “a man with a simplistic, dangerous worldview, a member of the extreme right who supports annexing territory on the West Bank to Israel”. On the Israeli political map, Friedman is well to the right of Benjamin Netanyahu. Odd as it may sound, Netanyahu is one of the more moderate politicians in the coalition government he heads. This is the most right-wing, racist, xenophobic, expansionist, and pro-settler government in Israel's history. Despite the occasional rhetorical genuflection by Netanyahu in the direction of two states in the distant past, both he and his ministers are decidedly opposed to a Palestinian state. They have built a network of roads on the West Bank for the exclusive use of the settlers with the intention of making the status quo permanent. In the lead-up to the elections of 2015, Netanyahu stated categorically that there would be no Palestinian state on his watch. Avigdor Lieberman, the leader of the ultra-nationalist Yisrael Beiteinu party and the defence minister, is himself a settler who aggressively pushes the settlers’ agenda in the cabinet. Naftali Bennett, leader of the religious-nationalist Jewish Home party and minister of education, is vehemently opposed to a Palestinian state in any shape or form. He advocates the outright annexation of Area C which comprises 60% of the West Bank where the majority of the settlements are located. Ayelet Shaked, the minister of justice, is another member of the Jewish Home party with far-right, ethnocentric, and genocidal views. She is spearheading the attack on one of the last bastions of Israeli democracy and the rule of law – the Supreme Court. Shaked was the driving force behind the law recently passed by the Knesset to legalise theft. Calling it the Regularization Bill could hardly conceal its highly irregular and crudely discriminatory nature. A more honest name would have been the Expropriation Bill. For what the bill did was to retroactively legalise 50 Jewish outposts, with around 4,000 homes, on the West Bank that had been built illegally on private Palestinian land. The bill is a naked land grab by the settlers and their sponsors whose purpose is to erase any prospect of a viable Palestinian state. Israel's attorney general, Avichai Mendelblit, said he would not defend the law in the Supreme Court, calling it unconstitutional and a violation of the Fourth Geneva Convention. Netanyahu initially opposed the bill, warning his cabinet that it could land its backers at the International Criminal Court in the Hague, but he changed his mind for fear of losing votes to his militant political rivals. Both Netanyahu and the hawks in his cabinet were overjoyed by the election of Donald Trump. They expected him to give them a free hand to pursue their aggressive colonial project in what they call Judea and Samaria – and they were not far wrong. Naftali Bennett tweeted: "Trump’s victory is an opportunity for Israel to retract the notion of a Palestinian state”. Two days after Trump’s inauguration, the cabinet announced two decisions: to issue permits for 5,500 new housing units, and to build an entirely new settlement on the West Bank. The second decision was a clear violation of an official pledge that Israel had given to the US at the time of the Oslo Accord not to build new settlements. The idea behind the pledge was to give peace a chance. The reaction of the White House to these provocative announcements could have hardly been more equivocal. The statement read: “While we don’t believe that the existence of settlements is an impediment to peace, the construction of new settlements or the expansion of existing settlements beyond their current borders may not be helpful to achieving that goal”. Muddled as it was, the statement signalled a clear reversal of American policy since 1967 which held that all settlements on occupied Arab territory are illegal and an impediment to peace. This permissive attitude towards Israel's violations of both international law and its promises to its chief ally assured Netanyahu of an easy ride on his meeting with the new incumbent at the White House. The contrast with his first meeting with Barack Obama in 2009 could hardly have been greater. At that meeting Obama wanted to focus on solving the Israeli-Palestinian conflict while Netanyahu tried to side-line this issue by focusing on the threat of the Iranian nuclear programme. Obama identified an Israeli settlement freeze as an indispensable condition for any progress in peace-making. Netanyahu’s persistent refusal to freeze settlement activity soured his relations with the Obama administration. Yet, despite his evident personal loathing of Netanyahu, Obama gave more money and arms to Israel than any of his predecessors. His parting gift was a $38 billion military aid package for the next decade. With this gift securely in his pocket, Netanyahu could look forward to a new era in Israel-US relations and to taking advantage of a new president whose ignorance and insecurity made him an easy target for manipulation. 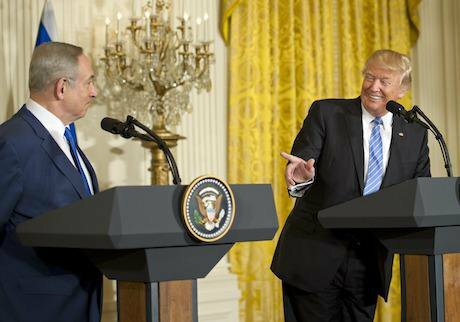 At the press conference with Trump, Netanyahu was evasive on the subject of a two-state solution. Rather than dealing with “labels”, he said he wanted to deal with substance. But his substantive position was completely uncompromising: “There are two prerequisites for peace”, he said. “First, the Palestinians must recognise the Jewish state…second, in any peace agreement, Israel must retain the overriding security control over the entire area west of the Jordan River…otherwise we’ll get another terrorist Islamic state in the Palestinian areas, exploding the peace, exploding the Middle East.” Netanyahu’s insistence that the Palestinians recognise Israel as a Jewish state is a relatively recent condition that he himself invented in order to make it difficult for the Palestinians to engage in peace talks. His second condition leaves no room for Palestinian sovereignty or statehood in any meaningful sense of these words. Netanyahu routinely reiterates that he is ready to start peace talks with the Palestinians without any preconditions. This is a transparent propaganda ploy. The two “prerequisites” reflect his deep ideological commitment to hold on to, in perpetuity, what he calls the “Land of Israel”. Netanyahu grew up in a fanatical revisionist Zionist home. In a 2009 interview his octogenarian father, Benzion Netanyahu, asserted: “The two-state solution doesn’t exist…There is no Palestinian people, so you don’t create a state for an imaginary nation”. This apple hasn’t fallen far from the tree. At the press conference Trump said to his guest: “I’d like to see you hold back on settlements a little bit”. This may sound like a mild rebuke, but it was not intended nor was it taken as such. On the contrary, this remark was actually helpful to Netanyahu, and he may have even solicited it himself. As prime minister, Netanyahu has to maintain a delicate balance between his right-wing coalition partners for whom any talk of peace is anathema and the pretence that his government is seeking a peaceful solution to the conflict. His partners-rivals are urging him to annex the strategic settlement blocs round Jerusalem, Ma’ale Edumim and Gush Etzion. He, for his part, lectures them on the need to coordinate their moves with the new president. Trump’s call for holding back a bit enables the embattled prime minister to protect his flank and to restrain the parties to his right. The friendship with Trump also helps him to bolster his position with the Israeli public at a time when he is being investigated by the police for receiving illicit gifts of champagne and cigars from a billionaire businessman. Netanyahu’s overriding goal is to maintain the status quo with only minor adjustments, and this he largely achieved at his meeting with the most powerful man in the world. The other major item on the two leaders’ agenda was Iran, and here too there was a convergence of Israeli and American positions. Netanyahu had been the most strident opponent of the nuclear agreement reached between the Obama administration and five other world powers with the Islamic Republic of Iran. He claimed that Iran could not be trusted and that a nuclear-armed Iran would pose an existential threat to Israel. The warning was coupled with threats of an Israeli military strike to prevent Iran from acquiring nuclear weapons. These threats were not credible. At that time, none of Israel’s defence chiefs supported military action. Major-General Meir Dagan, soon after stepping down as director of the Mossad, said that this was the silliest idea he had ever heard. The considered opinion of Israel's securocrats was that the landmark international agreement with Iran actually served to reduce the potential military threats to their country. The real concern which united the prime minister with his intelligence and defence chiefs was that the nuclear agreement would pave the way to a more general American-Iranian rapprochement and that this would downgrade Israel's role as America’s primary strategic partner in the region. So while Netanyahu’s verbal assaults on Iran continued after the conclusion of the treaty, the threat of military action was quietly dropped. The election of Donald Trump went a long way to allay Israeli concerns. During the presidential campaign candidate Trump echoed Netanyahu’s rhetoric, promising to tear up the nuclear deal that Obama had signed with Iran in July 2015. Following his election, however, Trump moderated his position, if not his rhetoric. His administration imposed new sanctions on Iran for its ballistic missiles tests, but these were consistent with the American obligations under the nuclear deal. So by the time Netanyahu arrived in Washington, the threat of a US-Iranian détente had receded. At the 15 February press conference, Trump called the agreement with Iran “one of the worst deals I’ve ever seen”, but he said nothing about abandoning or even renegotiating it. So once again America and Israel were singing from the same hymn sheet. What was absent from the press conference was any consideration for the rights and aspirations of the Palestinian people. Their “prerequisites” for peace were not mentioned even once. Echoing one of Netanyahu’s regular talking points, Trump castigated the Palestinians for allegedly teaching their children to hate Israel. His indifference to a one-state or two-state solution betrayed a shocking ignorance of the implications of the former. A one-state solution can mean one of two things. It can mean a secular democratic state stretching from the Jordan River to the Mediterranean Sea with equal rights for all its citizens regardless of religion or ethnicity. This kind of a unitary state is anathema to all but a tiny fringe of left-wing Israelis because sooner or later the Jews will become a minority. The alternative is one state with two systems, in other words, a state in which the Jews preserve all their powers and privileges and the Palestinians remain second-class citizens in perpetuity. There is only one word to describe this scenario – apartheid. A solution along these lines, if it can be called one, is totally unacceptable to the Palestinians. The Palestinians, the real victims of this bitter and protracted conflict, will accept nothing less and they deserve nothing less than a fully independent state alongside Israel with a capital city in Jerusalem. Moreover, a genuine two-state solution commands the support of the broadest international consensus which included, until the bizarre press conference at the White House, the United States of America. All the international efforts to resolve the Israeli-Palestinian conflict since the Gulf war of 1991 have been based on the premise of two states. The Arab states are part of this international consensus. In 2002 the Arab League put forward the Arab Peace Initiative. It was endorsed by all 22 members of the Arab League. It offered Israel not just peace but normalisation with all of them in return for the creation of an independent Palestinian state along the 1967 lines with a capital in East Jerusalem and a just solution to the Palestinian refugee problem. There has been no official Israeli response to this offer. The truth of the matter is that Israel is addicted to occupation, and it will continue to resist with all its might any international efforts to end it. So the Palestinians are engaged in what is probably the last anti-colonial struggle of the postwar era. The asymmetry of power between Israel and the Palestinians is so great that a voluntary agreement between the two parties is inconceivable. A settlement of the conflict in line with the international consensus can only come about if America joins with the rest of the international community in pushing Israel into it. This has never happened in the past and there is even less of a chance that it will happen now under the one-sidedly pro-Israeli Republican administration. Donald Trump has simply abandoned the long-suffering Palestinians to the tender mercies of their Israeli oppressors. The notion that the Palestinians deserve justice does not appear to have crossed his mind. The most charitable explanation of his conduct is that he lives in a delusional bubble. Be that as it may, there isn’t even the faintest prospect on the horizon that the self-proclaimed deal-maker will be able to broker a peace deal to end this tragic century-old conflict.